Applebee’s Neighbourhood Grill & Bar come with everything you could want great service, excellent value, great prices and friendly atmosphere. Choose from a variety of foods like honey-grilled salmon, apples bees’ house sirloin, if it’s a full meal your looking for or a good time out with the friends and family there no other place like Applebee’s Victoria Avenue. 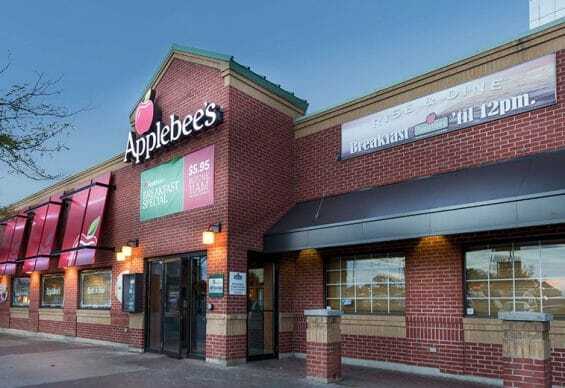 This Applebee’s Neighbourhood Grill & Bar is located in the heart of the tourist district of Niagara Falls Ontario, Canada and offers guests great pricing on fan favourites of Applebee’s Restaurant. This restaurant is also located beside the Days Inn Clifton Hill Casino Hotel, and across the street from the Casino Niagara. “The Perfect Margarita” is featured in Applebee’s friendly bar on Victoria Avenue. Applebee’s stands for great service, excellent value, caring Canadian style service and a friendly atmosphere. This family favourite has a menu to please any palate, with signature steaks and ribs a specialty. Whether it’s for breakfast, lunch, dinner or a late night snack, Applebee’s has the neighbourhood favourites you’ll love! Join us for food customers crave, great value and a relaxing atmosphere. Viva Italia! Lightly-breaded chicken breast topped with marinara sauce and a layer of mozzarella, Romano and Parmesan cheeses. Served with fettuccine marinara and garlic toast. Comfort food at its finest! A hearty tender boneless chicken breast, lightly breaded and chicken-fried. Served with garlic mashed potatoes, country gravy and fresh seasonal vegetables. Strips of grilled Italian or blackened chicken adorn this generous portion of pasta. This popular dish is topped off with tomatoes and broccoli and our delicious alfredo sauce. Plump and juicy shrimp on a bed of pasta tossed with fresh broccoli and a creamy Alfredo sauce. Topped with diced tomatoes and shredded Parmesan cheese and served with garlic toast. Breaded boneless chicken breast is delicately spiced and covered in a spicy-sweet orange glaze. Served in a big bowl over almond rice pilaf and a flavourful mixture of mushrooms, broccoli, red peppers, sugar snap peas, and shredded carrots. Topped with toasted almonds and crispy noodles. Mild white fish fillets deep-fried with a crisp batter. Served with French fries, cole slaw and tartar sauce. Sample two favourites: lightly-breaded chicken tenders and our famous Riblets basted with your choice of Applebee’s Original Zesty Barbeque Sauce or Applebee’s Honey Barbeque Sauce served with your favourite dipping sauce, French fries and cole slaw.